Yep. Someone on another site mentioned the same thing. I put my order in for a puck. I had seen it at my local Shoprite but then Shoprite stopped carrying it before I could grab a puck. I think they were charging $1.19. I decided, no more excuses. I need to find out what this mysterious Williams is all about. Interestingly enough, I also was able to find the new Gillette Pure Shave Cream there as well. Is Walgreens becoming shave friendly now? (02-04-2019, 11:50 AM)MntnMan62 Wrote: Yep. Someone on another site mentioned the same thing. I put my order in for a puck. I had seen it at my local Shoprite but then Shoprite stopped carrying it before I could grab a puck. I think they were charging $1.19. I decided, no more excuses. I need to find out what this mysterious Williams is all about. Interestingly enough, I also was able to find the new Gillette Pure Shave Cream there as well. Is Walgreens becoming shave friendly now? I've recently seen cremo, and clubman and other wet shaving items in local drug stores. i think we just got lucky i doubt walgreens is becoming any more shave friendly. let me know how that gillete cream works out. I've used it twice so far. It lathers like a beast. I can't say I've dialed it in yet but it does like water. For a cream that they say can be lathered just using your hands or a brush, it works really really well with a brush. So far I've found it to be reasonably slick and provide reasonable cushion, but not amazing. I'm wondering if that will change as I dial it in better. Scent is ok. Very mild citrus thing going on initially. Menthol is in the ingredients but didn't notice the menthol until my final touch up pass rinse. Post shave feel was ok, but again, not amazing. For less than $7.50 with tax this is a good cream. I look forward to seeing if I can elevate its performance by perfecting the lather consistency that I always try to achieve. Yogurty with a nice sheen. So far the sheen has eluded me. it lathers and works great for the price. I like my and other artisans' soaps better, but if I need to buy soap in a pinch this one would be it. I haven’t tried Williams in a long while. Truthfully, I couldn’t make a decent lather with it, so I stopped trying. (02-04-2019, 06:06 PM)chazt Wrote: I haven’t tried Williams in a long while. Truthfully, I couldn’t make a decent lather with it, so I stopped trying. I've heard that complaint. Some have said that blooming it solves that problem. I don't bloom any of my soaps but if I have to do that with Williams, I'll do it. I may not buy it again, but this is downright too dirt cheap not to try it. It's essentially legendary, for better or worse. Well, I can tell you from experience, the new Williams is nothing like the original. 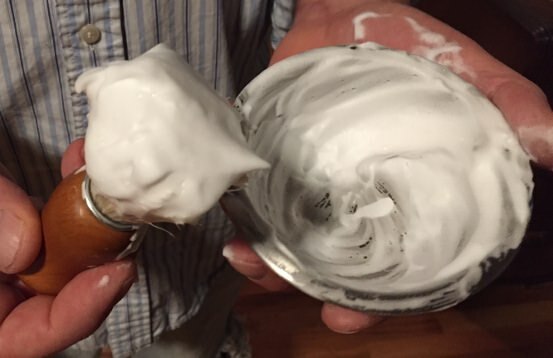 When I started wet shaving all I used was either Williams or Colgate, and if I wanted to splurge, I would buy a puck of Old Spice. From 1961 until 2010 that is all I used. Aftershaves were either Mennen Skin Bracer, Old Spice, or Aqua Velva. (02-05-2019, 04:35 AM)Johnny Wrote: Well, I can tell you from experience, the new Williams is nothing like the original. When I started wet shaving all I used was either Williams or Colgate, and if I wanted to splurge, I would buy a puck of Old Spice. From 1961 until 2010 that is all I used. Aftershaves were either Mennen Skin Bracer, Old Spice, or Aqua Velva. About when did the formula change, Johnny? Was the brand sold? Not sure about the brand being sold but I would not doubt it. Seems the product changed in the mid to late 90's. Thanks. So the product on the shelf today is barely a pale imitation of what you used. It’s too bad. I’ll bet their original formula would be a popular seller if they brought it back. My dad swears by this stuff! I am a Williams fan. I find you have to let it soak in nice hot water and just find the sweet spot by adding a couple drops of water at a time so you don't over-water the lather . Not the best, but it works great for me and I will always keep some in the den. I am using it exclusively this month. I have done this in the past and now it is a pleasure.